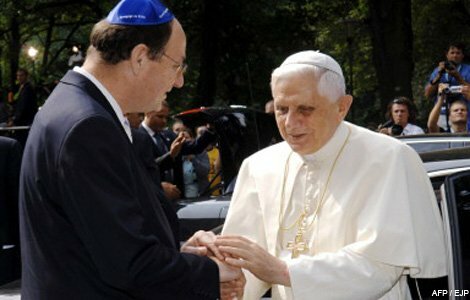 Again, neither of these will be "666" which, as clearly shown in Chapter 5, strictly rep- resents Nero's "number" & identifies the End Time False Prophet as being from Rome. 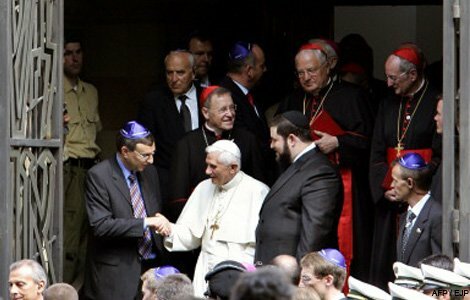 The Pope's name (Benedict) & his number (XVI) was warmly accepted on Jewish caps in the Jewish Community's welcoming of Benedict into Cologne, Germany's Jewish Temple. Which other world leader can cause that? 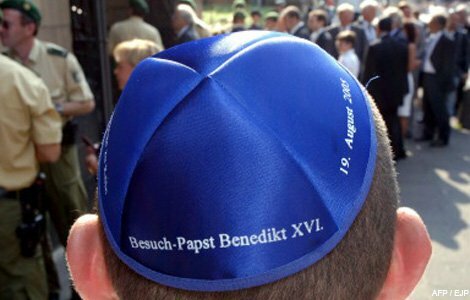 Michael Rado, Head of Cologne's Jewish community wearing Jewish cap with Benedict's name & number.